Once you’ve mastered the plank, add a total core “moving” challenge. 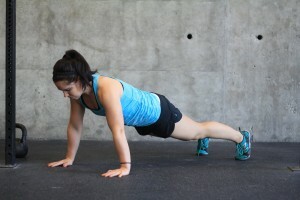 Here’s how: Begin in a pushup position, with your arms and legs straight and your torso straight. Keeping your feet in place, walk your hands to your right 3-6 times. Maintaining proper posture and spinal alignment, walk your hands to your left 3-6 times to complete 1 rep. Drop your knees to the floor and rest 10 seconds. Repeat 3-5 total cycles. 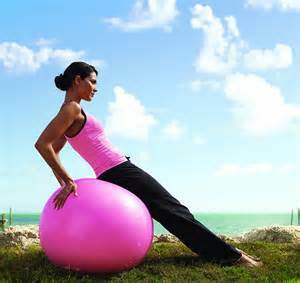 Choose a stability ball that is the appropriate size for your height. When sitting on the ball, your hips should be slightly higher than your knees. Stability is paramount. Before adding weights or a band to your exercise, make sure you’re able to sit or lean against the ball safety and securely. Form is important. You should be able to maintain proper spinal alignment, without any rocking side to side of your torso or weight shifting. Ask a Fitness Professional for proper instruction and exercises for your goals and ability.